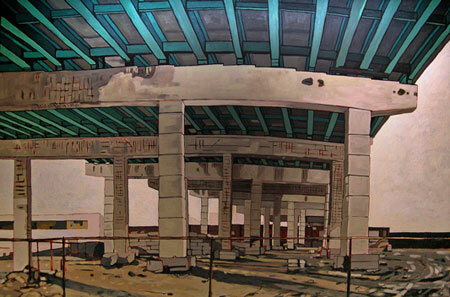 I’m really enjoying Rebecca Ott’s series of paintings inspired by the Gardiner Expressway. Driving it during rush hour sure isn’t pleasing, but it looks great on canvas. You can find Rebecca Ott at PINK 109 this year at the Toronto Outdoor Art Exhibition. This entry was posted on Monday, June 23rd, 2008 at 8:59 am	and is filed under Oils. You can follow any responses to this entry through the RSS 2.0 feed. You can leave a response, or trackback from your own site.